The streaming music service Pandora is roiling out a revamped brand campaign for spring. The “Sound On” campaign will run in six markets for 12 weeks and include the debut of a "sonic logo," an audio signature meant for consumers to associate with the brand. Pandora joins a number of other companies, including Chase Bank and Mastercard, that have created auditory logos. The company then commissioned 20 composers and sound designers, who created 200 possible logos, with Pandora conducting research to determine the final logo. 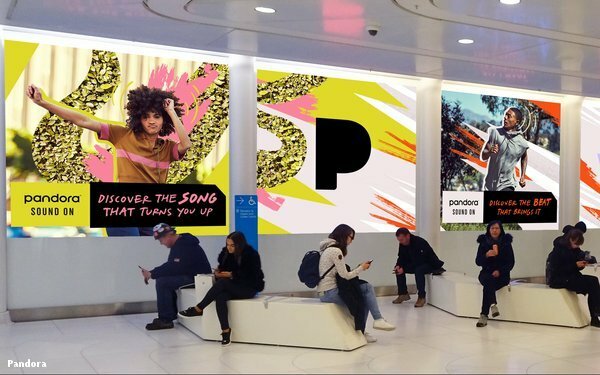 The “Sound On” campaign will run in New York, San Francisco, Oakland, Atlanta, Miami and Nashville, with takeovers in Times Square, the Oculus, the Nashville Sign and Oracle Arena, among other places. There will also be a robust digital presence across social media platforms and on Hulu, Vox Media and Group Nine Media properties. The spring campaign follows Pandora’s inaugural brand campaign, which launched last November. Artists including The Jonas Brothers, John Legend, 2 Chainz, and Becky G will appear in the campaign, which will also include sound walls, a social-media sound board, and a “Sound On” lounge at select music festivals. 1 comment about "Pandora Rolls Out New 'Sound On' Brand Campaign". John Grono from GAP Research, March 21, 2019 at 5:19 p.m.
Alex, I hope that Pandora's spring campaign is not 'roiling' but instead 'rolling' out.